The train was originally intended for the former Indian royalty. It comprised of personal coaches of the erstwhile rulers of the princely states of Gujarat and Rajputana, the Viceroy of British India and the Nizam of Hyderabad. More.. The Royal Rajasthan on Wheels is a luxury tourist train run by the Indian Railways. It is modeled on the Palace on Wheels, and follows a similar route through Rajasthan. Tourists are taken to several important tourist, wildlife and heritage sites across Rajasthan. More..
Heritage on Wheels is yet another initiative by the Indian Railways to bring tourists closer to Indian culture. In association with the Rajasthan Tourism Development Corporation, the Indian Railways have launched this luxury tourist train. 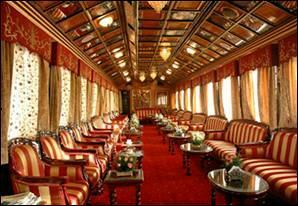 More..
Feel like the royalty on board the Palace on Wheels a completely self-sufficient train. Fully air-conditioned, the train comprises of 14 deluxe saloons, equipped with class amenities to enhance the pleasure of traveling. More.. The Royal Indian train that has been benchmarked against the best luxury trains in the world-like the Blue Train of South Africa. The Orient Express of Europe and the Eastern and Oriental of South East Asia. More.. The Golden Chariot: Pride of The South train named after the famous Stone Chariot in Hampi, a world heritage site, in Southern India will travel through timeless Historical Heritage Sites, Resplendent Palaces, Wildlife and Golden Beaches. More.. The Royal Orient is one of the few extravaganzas left of an epoch of grandeur. Enjoy yourself in the luxury of this fascinating train, a spectacular concept in transport, an aesthetic marvel of modern times. More.. The Fairy Queen, built in 1855, is the world's oldest steam locomotive in regular operation today, plying between New Delhi to Alwar in India. Indian Railways proudly offer a unique two days all-inclusive package by combining thrills, romance and wildlife and heritage on the Fairy Queen. More..